Imposing a record penalty on a company for polluting the environment, the Supreme Court Tuesday ordered Sterlite Industries, a subsidiary of Britain-based Vedanta Group, to pay Rs 100 crore as compensation for inappropriately operating its copper smelting plant in Tuticorin district of Tamil Nadu and damaging the environment between 1997 and 2012. The bench, however in “public interest”, refrained from ordering a permanent closure of the plant. It noted that Sterlite had removed 29 of the 30 deficiencies pointed out by experts and had contributed significantly towards copper production in India and provided employment. The bandh (total shut-down of the city) call given by protesters against Vedanta subsidiary Sterlite with the aim of permanently shutting down the company’s copper smelter unit following alleged leak of noxious gas evoked a good response in the town. Most of the shops and commercial establishments remained closed, with only a few medical shops and others selling essential items being open, an official said. “Sooner or later, we can rely on London’s Vedanta plc to arouse the ire of its many opponents by committing further criminal offences” That was a comment, made on the MAC website in July 2012, after the company had been accused of no fewer than three offences in two Indian states over the space of a few days. See: Vedanta accused of further serious violations in India Five months on, in December 2012, a judicial inquiry found Vedanta guilty of complicity in the deaths of at least 42 workers at its aluminium complex in Chhattisgarh. 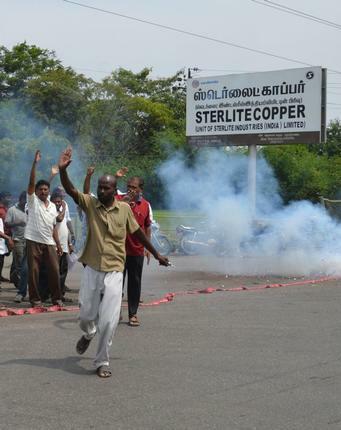 See: Vedanta found guilty of grave safety breaches in India Then, last week, its Sterlite subsidiary was ordered to close the country’s largest copper smelter at Tuticorin in coastal Tamil Nadu, after a 23 March leak of sulphur dioxide allegedly incapacitated many local residents.